Twitter is one of the mostly used social networking sitesin the world . 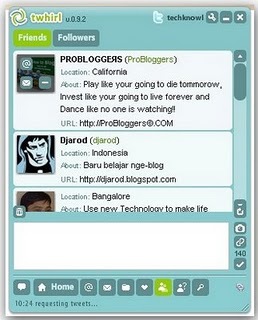 The most praised feature of Twitter is that it can be accessed from anywhere , from web , desktop ,mobile etc . There is something special about Twitter real time search ,it helps us to be updated with on going events in the web , media ,news and the life of common people .But sometimes its very difficult to sign into Twitter via web and we need to keep the page refreshed to get new tweets . Here comes the use of Twitter desktop applications like TweetDeck and Twhirl, which uses Adobe AIR technology to bring real Twitter experience in desktops . Intense Twitter users would probably know Twitter desktop clients like Twhirl and Tweetdeck . Since they uses Adobe AIR , they are platform independent and runs on Windows ,Linux and MAC . What you need a runtime environment , Adobe AIR framework pre installed on your machine. 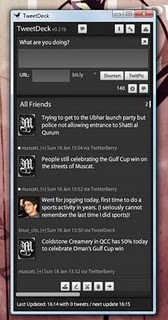 TweetDeck : TweetDeck is the No:1 Twitter desktop client as per the latest usage statics. You can send receive tweets , Shorten URLs , send direct messages ,attach Twitpics , translate tweets and many more . New version has Facebook support that lets you to update both statuses at same time . Tweetdeck resides in taskbar,refreshes and you will get notifications when someone updates their timeline . 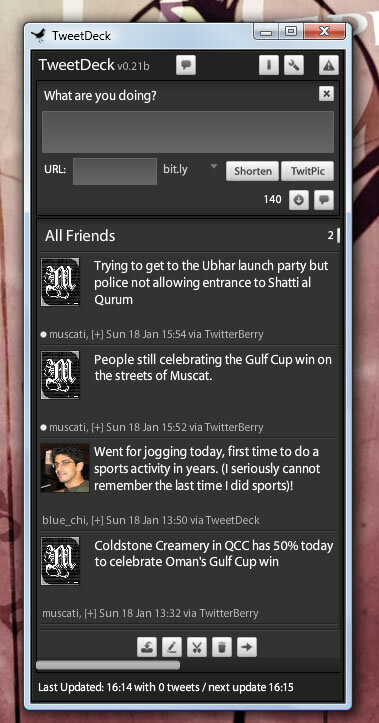 Download TweetDeck Twitter desktop client . Twhril has a more compact architecture than TweetDeck . Twhril supports Friendfeed , Seesmic ,identi.ca and laconi.ca accounts . Users can update their Facebook , Linkedin , MySpace statuses as a whole . Record Videos in Seesmic and and share them with Twitter friends . Spell check Tweets /Updates . Shorten URLs and Send images . Download Twhril Twitter desktop client .